I received a number of requests for poster versions of "Summer 2014." They are now available from the League Store, here. Please be advised that because I'm the one who drew it, the aspect ratio is not at all normal. Sorry about that. Despite the unusual shape, Zazzle still offers a choice of sizes and paper types, so at least you're covered on that front. Click here to see more posters from the League Store. Send these greetings year-round with cards from the League Store. Now available in the League Store. Boost an ego today! Internet access is unreliable in the great outdoors! Reference this handy flow chart on tangible objects from the League Store. 13 TRANSLATIONS AND COUNTING! Thanks to the efforts of everyone who's helped expand the global footprint (eyeprint?) of this chart. All known versions are listed below and more are always welcome--feel free to get in touch via comment or the League's contact page. Spanish, Italian, and Polish are here. First Dravidian appearance: Tamil, here. Joined shortly thereafter by Kannada, here. Followed by Norwegian, featured here. Arabic and Dutch are together, here. Turkish, Hungarian, Portuguese and German versions are here, with only mild scolding. "SOMETIMES-HUMOROUS BUT MOSTLY-ACCURATE": In June 2014, this sky guide enjoyed some cosmically impressive company over on the NASA-affiliated Astronomy Picture of the Day (APOD) site and the League shared its excitement here. A repeat appearance in September 2017 was a pleasant surprise. Thanks, APOD! It was only a matter of time, really. The unofficial tag line of The League now has its very own collection. The options for meta-expressing your (and your infants'!) ennui, etc. are plentiful. And if you haven't visited the League Store recently, why not explore for a bit? I've made a number of improvements and additions over the past few months. 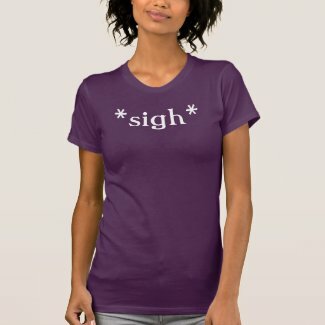 The Zazzle folks have also completely overhauled the entire site and it's, like, super hipster now. Which means some baffling design choices, but a generally smoother interface. Check out more sighs of all sizes in the League Store. This cartoon is part of the "Literal Puns" series now featured in the League Store. Spice up your communication with the League Store's "Emoticons" collection! All Content Copyright © 2012-2019 by HK for The League of Lost Causes. Powered by Squarespace.